It is pretty much on the horizon nowadays, and it is not the right time or place to argue that Black Metal is not what it used to be. Thank god for the evolution of music, even Metal. It was kind of hard to actually spit out the last sentence, coming from a traditional approach towards the genre. However, at times, it seems proper enough to mention that there are plus points in any kind of progress. 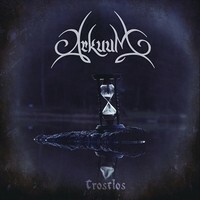 So here it goes with the standalone artist, ARKUMM, and his debut album "Trostlos". To be honest, Black Metal, with its new additions such as Post Metal and Shoegaze, isn't that rare these days. A lot of bands made it a purpose to preserve the blackened attitude but to sort of enhance it to be more alternative oriented and someone reachable. Similar to acts like ALCEST for instance, ARKUMM is of the same. I could also mention KLIMT 1918 to the mixture, yet I guess that it will become soon endless with examples. The main aspects of the music surrounding "Trostlos" are the melodic approach of the riffery and its surfaced catchiness. There is a measure of reoccurrence in the melodies and riffs, yet the intention is to succumb into a trance, hypnotic dirge smothered all over the place channeling echoes of slithering hopelessness. I am sure that no one planned on drenching into deep melancholy, yet it would be hard to deny the painful symptoms lurking within the music. These symptoms will serve as the totem for appreciating this piece and its atmospheric influence. The German sung tunes never really bothered, as I didn't really need to understand what was being said. Like in many cases of foreign languages in albums, the music does the talking. Tunes like "Ferne Welten" and "Morgengrau" said it all when it comes to the definition of haunting al'a the soft smudges of the melodic sensation whether by a guitar or piano, varied punches of the skins, and the gripping demonic vocals, made it possible for me to sit back and swim deeper into the wicked form of heavenly dreaming. Not yet known for its efforts, if played right, ARKUMM might turn into something bigger in the end.